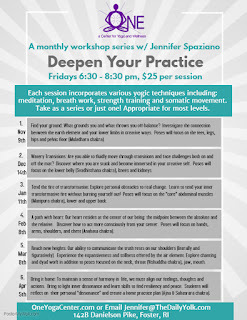 including: meditation, chanting, breath work, strength training and somatic movement. any workshop can be taken on it's own. Most levels can attend any session. At One Yoga in Foster, RI. See our website and Facebook page. Find your ground: What grounds you and what throws you off-balance? Investigate the connection between the earth element and your lower limbs in creative ways. Poses will focus on the feet, legs, hips and pelvic floor (Muladhara chakra). Sometimes we all need a little love. 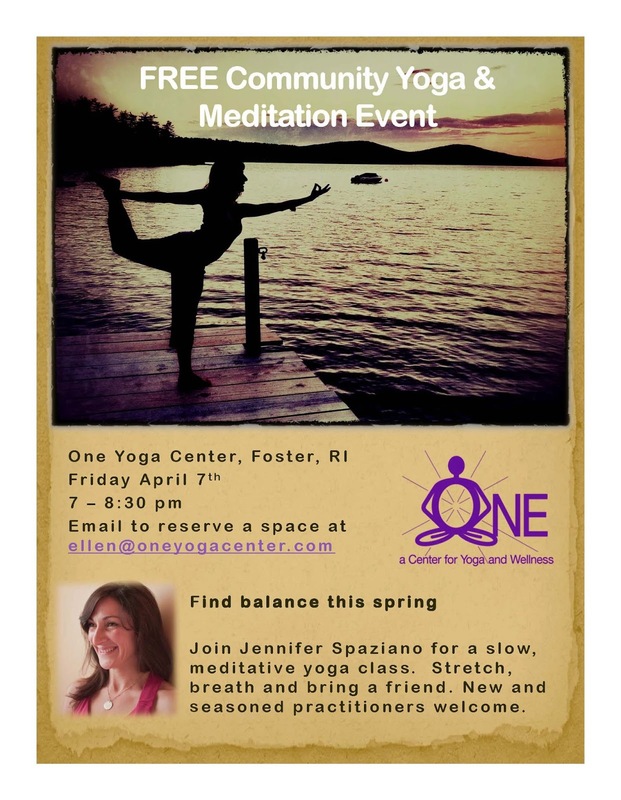 My way of expressing gratitude toward my community this spring is a free Friday night yoga class April 7th from 7 to 8:30 pm. 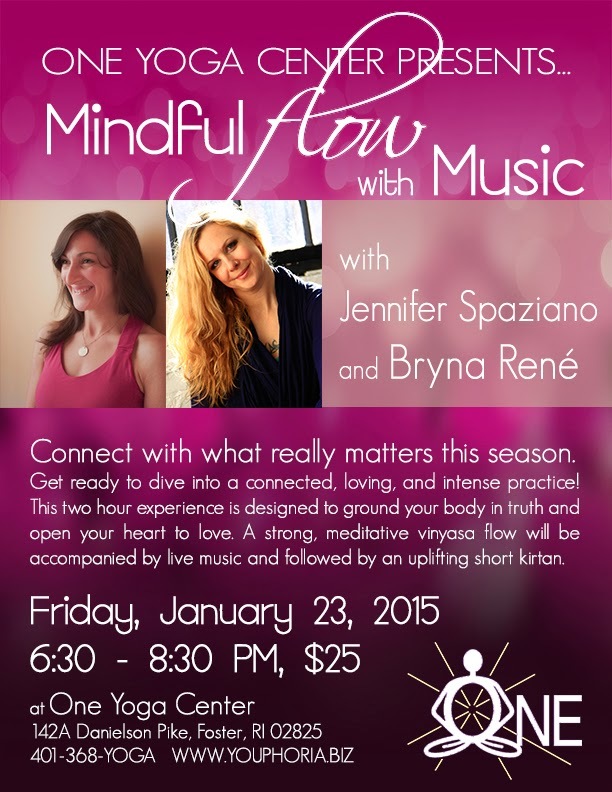 Join me and the extremely talented musician and kirtan extraordinaire Bryna Rene for Mindful Flow with Live Music this Friday 6:30 pm at One Yoga in Foster, RI! The three chapter per week rule is getting even more difficult to follow - not because the chapters are difficult to read, rather, they pack so much information I can’t possibly condense the wisdom into a five minute opening meditation for a vinyasa yoga class. So while we prepared this week by reading chapters 7 (Courage), chapter 8 (Compassion) and chapter 9 (Control) - I chose to leave compassion to the end. Oh, and flipped around the order too. It was much easier for me to lay the groundwork first by describing control - and how it moves us. Ultimately, true courage is necessary to break down our need for power over our surroundings and to fully surrender to the truth in every moment. While compassion would have neatly fit as a third step - this alone was enough to ponder while practicing our handstands (yup, we did them again - only after full splits). What more could build up that courage muscle!? The more we try to control the less we are in control. You may have experienced this intimately in a close relationship, where you just wishes they would do X or say Y. Then everything would be perfect, right? The yoga tradition teaches us that such need for control only separates us from truth. It builds walls rather than inroads and definitely won’t win you any friends. Labels. We all use them. And with any good thing, human nature tends towards overuse. When we like something we latch on, clamping down for dear life. Eventually the "good" sensations aren't "good" enough, and perhaps even shift closer to bad on the spectrum of experience. How could this be? That which was so good at one point can now invoke the opposite feeling? And how do these labels "good" and "bad", probably the most pervasive of all labels, serve us in our understanding of this moment? Unfortunately, this dualistic schema is inherently a false one that - while useful in some cases - cannot and will not bring us into a direct experience with reality or in other words, the truth. We got chickens recently which need to be closed up at night for obvious reasons. These reasons, however, escaped my four-year-old daughter who innocently inquired as to "why". "Why, mommy, must we lock up the chickens at night?" "Well, so we don't loose them." "We won't loose them. They can't see at night and they sleep anyway. They'll stay in their coop." "Well, there are animals in the woods that come out at night, like foxes, that would like to eat our chickens. If you want to continue receiving eggs from them we have to protect them and lock them up at night." "Oh." (I could now see a question coming ... her wheels were turning) "Mommy, those are bad foxes right? Not like in the book 'Fox and the Hound'. He's a good Fox but the ones that want to eat our chickens those are bad foxes, right mommy." Sigh. Little did I know that my four-year-old already had logic skills. When we call something good, she immediately insinuates now that the opposite of that which I called good is bad. Even down to her own existence. Because, one moment, she's a "good girl" for cleaning her room. She must, therefore be a "bad girl" when she doesn't. And who wants their children to consider themselves as inherently "bad" ever? And now the fox. How do I explain that the fox in the woods that wants to eat our chickens is not bad nor good. He's being a fox. Or as my philosophy professors would say, he is exhibiting "fox-ness". The third yoga sutra states "and then, the seer resides in his true nature." But this "residing" can only occur after sutras one and two which state that "the practice of yoga begins now" and that "yoga begins when the turnings of the mind are released." You see, the labeling machine that is our human mind can be over used. It attempts to override our experience in a futile attempt to protect us from suffering. In the end the coupe of the body by the mind causes suffering. Unlike the fox that eats the chickens without remorse, human "vritti" or "turnings" blind our ability to live our truth or in other words, "to reside in our true nature". What is human-ness? What is at the heart of our human nature? And what blocks us from exhibiting those qualities without restraint or worry? Practice some yoga to find out.